If you fail to adapt your driving style, cruise control can neither reduce the risk of an accident nor override the laws of physics. Cruise control cannot take into account the road, traffic and weather conditions. Cruise control is only an aid. You are responsible for the distance to the vehicle in front, for vehicle speed, for braking in good time and for staying in your lane. Do not use cruise control: • in road and traffic conditions which do not allow you to maintain a constant speed e.g. • when there is poor visibility, e.g. due to fog, heavy rain or snow If there is a change of drivers, advise the new driver of the speed stored. To activate cruise control, all of the following activation conditions must be fulfilled: • the electric parking brake must be released. • you are driving faster than 20mph (30 km/h). ■ Accelerate the vehicle to the desired speed. 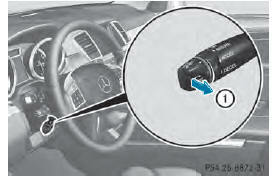 ■ Briefly press the cruise control lever up 1 or down 2. You can accept the current speed if you are driving faster than 20 mph (30 km/h). 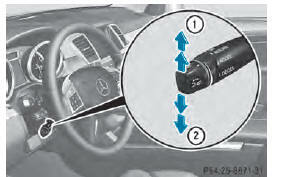 ■ Press the cruise control lever up 1 for a higher speed or down 2 for a lower speed. 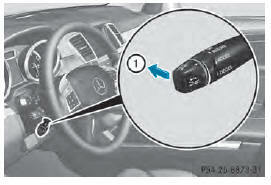 Cruise control is automatically deactivated if: • you engage the electric parking brake. • you are driving at less than 20 mph (30 km/h). • you shift the transmission to position N while driving.